302 PANCAKES — Ever wonder what 302 strikeouts in a season will get you? 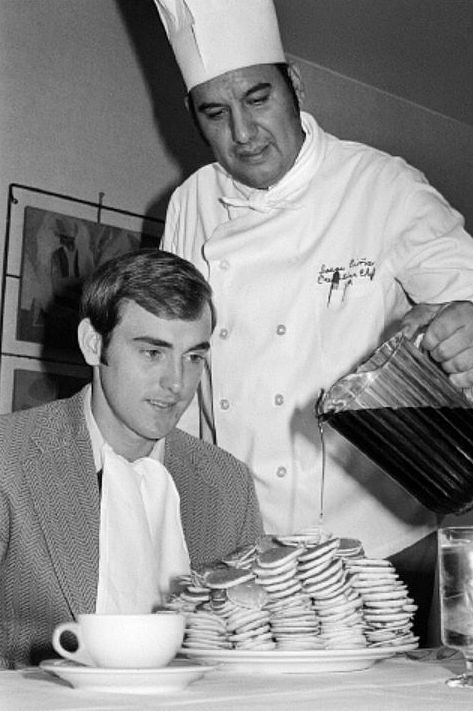 If you’re a batter, you may lose your job, but if you’re a pitcher like Nolan Ryan, left, of the California Angels, [you] will at least get 302 silver dollar pancakes. This was the breakfast that awaited Ryan Tuesday after his 3-hit, 12-strikeout win over the Texas Rangers Monday. The executive chef at the Sheraton Dallas [Isaac Pina] produced the breakfast for the Alvin native, a former New York Met, who is the sixth pitcher in major league history to strike out more than 300 batters in one season. Judging by the expression on his face at the next day’s breakfast table, it’s pretty obvious the 25-year old Nolan Ryan enjoyed his triumph. Photo ©Bettmann/CORBIS. The photo is also seen on this page, from The Guardian, which shows a collection of really great historic baseball photos — a bit of a surprise, coming from a British newspaper! The photo was published in newspapers around the country; the quoted wire copy appeared in the Sept. 27, 1972 edition of The Waxahachie Daily Light. To read a passage from the book Nolan Ryan’s Pitcher’s Bible in which he writes about the importance of his high-carb breakfasts (Day One: Pancakes…), see here. The Wikipedia entry on Nolan Ryan is here; his stats are here.